I have an aerial photo which doesn't match up with ESRI world imagery basemap in ArcGIS 10.2. I didn't add the AP or georeference it. It was already in the project when I started. I'd really like to know how accurate that ESRI basemap world imagery is? I know Google imagery has issues, it shifts in Google Earth or QGISfor example. Does the ESRI world imagery basemap suffer the same sort of unreliability problem. I cannot find any information on this, but I need to know whether to trust the AP. It depends where you are in the world. The World Imagery basemap is assembled from imagery from many different sources, shot at different times and with different post-processing. I don't think there is a way to find out exactly how far off it is without comparing it against some other data which has a known accuracy. I think the problem is the basemap imagery is on Web Mercator as Thiyaku points out. With other layers this problem could be resolved by reprojecting the raster using the Data Managament>Projections and Transformations>Raster>Raster Project tool in Arctoolbox. (This ESRI blog https://blogs.esri.com/esri/arcgis/2010/03/05/measuring-distances-and-areas-when-your-map-uses-the-mercator-projection provides more details.) Unfortunately the Raster Project tool doesn't appear to work with ESRI basemap imagery. On a side note I hadn't realised that adding the basemap imagery changes the Project CRS from Greek Grid into Web Mercator. I know QGIS does this, but I had thought Arc was smarter. Changing the Project CRS didn't solve my problem, but I think it's useful to know that it changes with the basemap imagery. ESRI base map (most of Web maps) is in Web mercator projection, so it will have more distortion in size when moving away from Equator. There accuracy of this maps will vary place to place, depends on how far from Equator. Not the answer you're looking for? Browse other questions tagged arcgis-10.2 arcgis-online-basemaps world-imagery or ask your own question. Measuring acreage from satellite image? download ESRI World Imagery basemap for offline use? Connecting QGIS to ArcGIS world imagery? Locating WMS on Esri basemap? Avoiding Esri basemap (Bing imagery) to update? Is there a Reference Layer in the World Imagery Basemap? 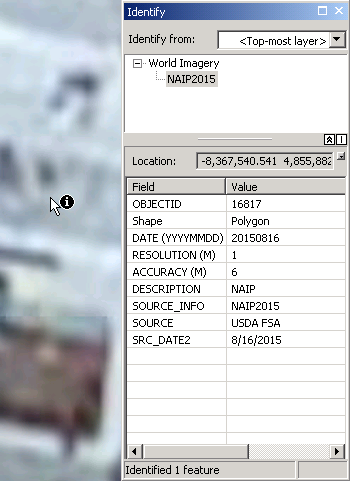 Esri ArcGIS Imagery Labels too small?